Months of hemming and hawing finally give way to a full redesign for a strip where hundreds of pedestrians and cyclists have been injured and one killed since 2010. After further review … the DOT will go ahead and save lives on Morris Park Avenue. The city Department of Transportation told Streetsblog that after months of wavering it will defy a Bronx community board and push ahead with an ambitious plan to tame speedway conditions along the roadway, where 426 pedestrians and cyclists have been injured, with one fatality, since 2010. 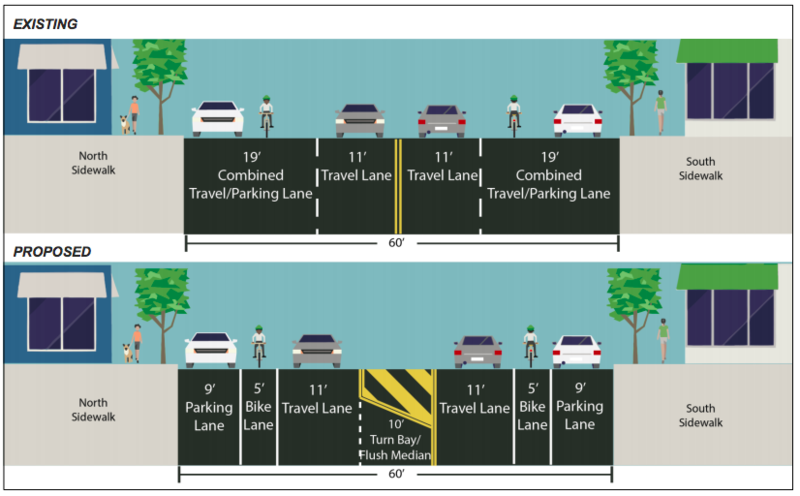 The decision reverses an earlier move to abandon the full 31-block plan between Adams Street and Newport Avenue in favor of a shorter, 13-block redesign on the eastern segment of the avenue that would eliminate one lane of car traffic in each direction to create turning bays and a painted bike lane on each side of the roadway. As Streetsblog prepared a story about the DOT’s surrender to some area business owners and residents who claimed the plan would cause congestion, the de Blasio administration restored the full 31-block plan. DOT officials said they returned to the full plan only after reaching out repeatedly to local critics and realizing that the fact-free NIMBYs simply would not be appeased by the shorter, “phase one” version anyway. 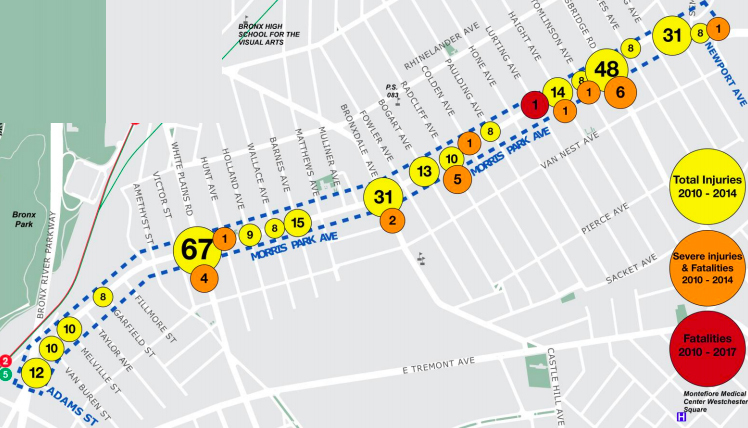 The full 1.7-mile plan was unveiled in February [PDF] after the DOT identified Morris Park Avenue as a “Vision Zero corridor” due to its high crash rate. The roadway seems to be designed for speeding: it features two wide travel lanes in both directions and lots of double-parking, which frustrates drivers and encourages them to speed more once the roadway opens up again. A handout from DOT shows how many crashes have occurred on the notorious speedway. Opponents like Gjonaj frequently untethered themselves from reality and their own eyes. Indeed, a speeding car is featured prominently in a News12 segment made over the summer that was actually trying to be sympathetic to the opposition to safer streets. In the report, Community Board 11 Executive Board Chairman Al D’Angelo, who spearheaded the board’s rejection, gestured toward the speeding car — then concluded, without explanation, that the city plan to remove one lane of car travel would somehow make things worse. “D’Angelo says speeding cars cause the injuries the DOT worries about,” the reporter said, preferring not to consider that statement in the context of the DOT plan to reduce speeding with its time-tested traffic-calming efforts. 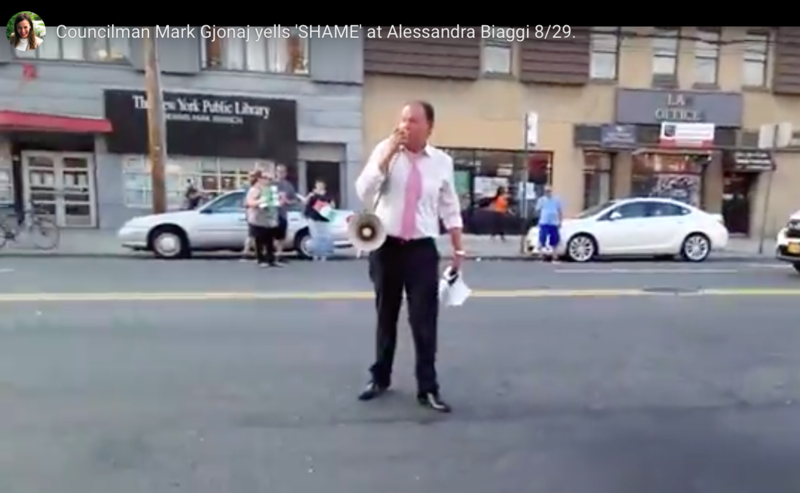 Here’s Council Member Mark Gjonaj chanting, “Shame! Shame!” in the middle of the street to protest traffic safety improvements to Morris Park Avenue. Indeed, D’Angelo and his CB11 colleagues are willfully ignoring the essential fact that city traffic calming projects have consistently improved safety. On commercial Vanderbilt Avenue between Grand Army Plaza and Atlantic Avenue in Brooklyn, DOT says injuries fell by 15 percent. On Macombs Road between University and Jerome avenues in The Bronx, injuries dropped by 41 percent. On Jewel Avenue between 164th and Main streets in Queens, a four-lanes-to-two-lanes conversion reduced injuries by 37 percent, city statistics show. “In 2009, we did a similar conversion on Allerton Avenue from East Gun Hill Road to Boston Road and pedestrian injuries are down 50 percent there,” Lopez said. The challenge for transportation planners, Lopez added, is that so-called road diets are counterintuitive if your opinion of how roads should work is formed from behind the wheel of a car. Lopez reiterated that DOT statistics show that traffic-calming plans do not significantly increase travel times. Drivers think they are going slower, but street design often decreases double parking — a real problem on Morris Park Avenue — and, as a result, maintains traffic flow, despite one fewer lane. But above all, Lopez said the changes on Morris Park Avenue, which will be built in the spring, are a life-and-death issue. It’s not the first time Mayor de Blasio has implemented a life-saving project despite community opposition. Earlier this year, he bucked a Queens community board and built paired protected bike lanes in Sunnyside. And the mayor says he still supports the completion of a four-phase reconstruction of Queens Boulevard, though the final segment has been delayed. The first three parts of the project have reduced fatalities on the former “Boulevard of Death” to zero. Our annual donation drive continues. Really like how tough Bronx Boro Commish Nivardo Lopez is. We need more leaders like him. Can’t they do 6 foot painted lanes? Door zone is about 3.5ft-4 ft from curb. A foot helps. ( Why can’t through lanes be 10 feet, like the median, instead of 11 wide? Get up, Stand up. Stand up for the fight. I’d like to see 10-foot travel lanes as well. But I’d rather see the bike lane against the curb, separated and protected. Glad leaders are doing the right thing, I wouldn’t call painted bike lanes ambitious in the slightest. It’s barely an improvement on what was there before, which is why the opposition to this plan is really stupid. As would I, but a 6 foot wide PBL would be unusable. parking for customer access” as this slide from the DOT presentation says. What merchants/business owners SAY does not equal what is true. I would imagine that along this corridor most people arrive at businesses by foot or by transit. DOT shouldn’t put findings like this in presentations if those findings come from surveys of business owners instead of customer intercepts. Cool, now do Frederick Douglass above 121st St! I don’t think that they’re saying that most of their customers drive to their businesses, but that of those who do drive, they must use street parking because the business does not have it’s own parking lot or garage. 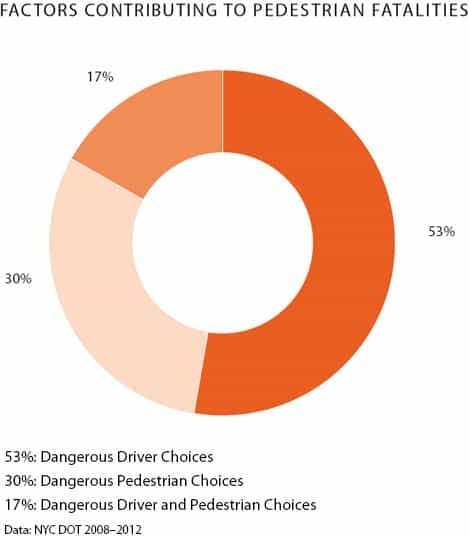 It’s kind of confusing but I think in the context of the other statistics they’re more or less talking about how people park, and how the adjacent curb space is used, rather than what mode of transportation a person or delivery company uses to get there. So, in a way, because the businesses rely on street parking, that suggests a more dense, urban environment where many people will in fact either walk or take transit to the various businesses rather than a suburban district where every business has a parking lot out front. The double parking of the (relatively small, nimble) delivery box trucks tells me that these businesses don’t have back-of-store delivery alleys or loading docks and that prioritizing curbside delivery zones would probably be useful for preventing trucks from parking in the bike lane. This is great news, so I don’t want to harp too much on word choices in the piece. But it’s striking that we can talk of the City government “defying” a Community Board, as though these klown kolleges, and not our elected representatives, were the ones in charge. The very fact that this language occurred to the author tells us how far wrong we’ve gone. Let’s hope that this signals the start of a new trend. Community Boards are just fine for deciding what colour banners will hang on the lampposts, and for booking the Italian sausage truck for the street fair. But when it comes to important decisions, Community Boards need to get the f out of the way and let the grown-ups get on with it. Agreed. Alternately, they could stripe the parking at seven feet and widen the bike lane to six, perhaps with some door zone hashing. I’m very happy that Morris Park Ave is finally getting a road diet, but I still don’t understand why the NYCDOT didn’t do the same for Soundview Avenue. White Plains Rd, East Tremont Ave, Castle Hill Ave, Bronx River Ave, Intervale Ave, all of these streets are examples of those converted from four to two lanes in recent years. For some odd reason, Soundview Avenue, which sees the least traffic of all maintained four. This is the route to the new ferry terminal and could use bike lanes. Ok, great. Nice to see DOT do the right thing in the face of irrational opposition. SO WHERE ARE THE DYCKMAN STREET BIKE LANES? It’s a real shame that they have still got the cycle lanes on the wrong side of the car parking, but otherwise this looks good. This plan is rather un-ambitious. I am glad the DOT will go ahead with it without “Community” Board approval, and thanks to Nivardo Lopez for supporting it. Maybe Nivardo Lopez will appoint different people to the Community Board since 50% (25 of the 50) of those members will have terms ending this winter. And thanks to de Blasio for supporting going ahead with the re-design. But this plan, with in-the-door-zone, perfect-for-double-parking bike lanes, with 11′ travel lanes (too wide for 25mph), with maintenance of the current amount of free/underpriced curbside parking, seems like a cutting edge plan circa 1995 but is rather wimpy considering the innovations available for better road design today. But at least it is progress. You need to give people time for adjustment. Every jurisdiction that has investigated the cause of bike/car collisions – London, West Midlands, Australia & even Hawaii – has found the same result: the motorist is at fault for the vast majority of incidents. Alessandra Biaggi, challenging State Senator Jeff Klein in District 34, has come out in favor of the Morris Park Avenue redesign.